Lunch: Every day 13.00 hrs. from 15. April 2019. Evening: Every day, from 17.30 hrs. Close to the restaurant is a cosy area with sofas and tables where you can relax and enjoy your book with a good cup of coffee. You can directly access the pool area with garden furniture in the shade of large sun-umbrellas. If you haven’t booked your stay incl. breakfast and dinner, this can also be orderd during your stay at the hotel. 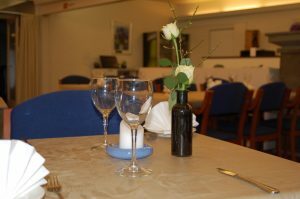 For private functions the restaurant can be divided into several smaller rooms, – has seats for up to 300 dining guests.